Rezistenţa Populară/Народное сопротивление (People’s Resistance; henceforth, RP) is a Marxist political movement that conducts popular protest actions and works to help the working class achieve self-identity and unity. The RP is convinced that the world of private entrepreneurs, thieving speculators, private banks, chronic unemployment, and armies of poor people—a world where the rich gradually grow richer while absolutely all other strata of the populace grow poor—is unjust and should be destroyed. It should be replaced by a world of social guarantees, a world without private ownership of the means of production and the exploitation of men by other men; a world where all the mean of production will belong to the whole society and will be used for its benefit, not merely for the enrichment of the minority constituted by the powers that be and the major private capitalists and owners. In our struggle with capital we are creating a revolutionary working-class party. We take our ideas to the masses by appealing directly to work collectives and all those citizens who do not wish to merely look on as they are constantly robbed and repressed by the current ruling clique. In its actions, the RP exposes the thieving essence of the neoliberal reforms now being carried out in Moldova by the ruling party. As strange as it may seem, this party is the Party of Communists of the Republic of Moldova (PCRM). However, the goal of the RP is not the gradual but pitiful improvement of workers’ lives or the constant struggle against discrete manifestations of developed capitalism’s negative tendencies, but the complete removal of the capitalist system as the underlying cause of all these phenomena. The RP was organized by former members and supporters of the PCRM who opposed the party’s total rejection of its own program and its declaration of a new policy in favor of the further entrenchment of capitalism in our country. This was preceded by a number of events, including, for example, the collapse of the Communist Youth League of Moldova (UTCM). The straw that broke this camel’s back was the trial of Yevgeny Nikolaev, a leftist activist from Moldova who was arrested at the AntiCap conference in Moscow in 2002. The leadership of the PCRM and UTCM made no attempt to gain their comrade’s freedom. Several groups emerged from the collapse of the UTCM—Communist Alternative, NBP-Moldova, and New Komsomol—while other activists simply left the movement. Thus, the Chişinău organization of the UTCM was left with only a few careerists to do the bidding of the PCRM. In late 2003, leftist activists agreed a series of joint actions and dubbed this campaign the People’s Resistance. The core of the RP is young people (under thirty-five). Among the RP’s participants are workers, clerical workers, students, teachers, and pensioners. The RP’s theoretical platform is Marxist-Leninist. The RP is open to collaboration with all anti-capitalist leftists engaged in real struggle. For example, we cooperate with the RRP (the Trotskyist Revolutionary Workers Party), the PCM-CPSU, and the NGO Salvgardare. In addition, the RP attempts to recruit other self-declared leftist organizations into active struggle with the capitalist system. The RP’s actions have included demonstrations, pickets, propaganda and education (mass leaflet campaigns at major social events and in connection with particularly important issues), protest petition campaigns, organizing house committees, the fight against in-fill construction, and work with factory and enterprise collectives before and during strikes. Since 2002, the PCRM has pursued a policy of neoliberal reforms. Immediately after his electoral victory, President Vladimir Voronin assured the business elite that he would not overturn the results of privatization. In 2003, the government announced that it intended to pursue integration with the European Union and continue the privatization of state enterprises and remaining state properties. Moldova sent a military contingent to assist US forces in Iraq. (The entire PCRM parliamentary faction—71 deputies—unanimously voted for this decision.) In late 2003, the RP (which originally was formed as the organizing committee for the action “The People’s Resistance”) planned a series of demonstrations against the authorities’ planned major offensive against the interests of workers (rate increases for such vital services as telephone, gas, etc; the introduction of insurance-based medicine). These actions took place in February and May 2004, and were partly successful. (For example, the government gave up its plans to raise rates for local telephone service although the decree to this effect had already been published). 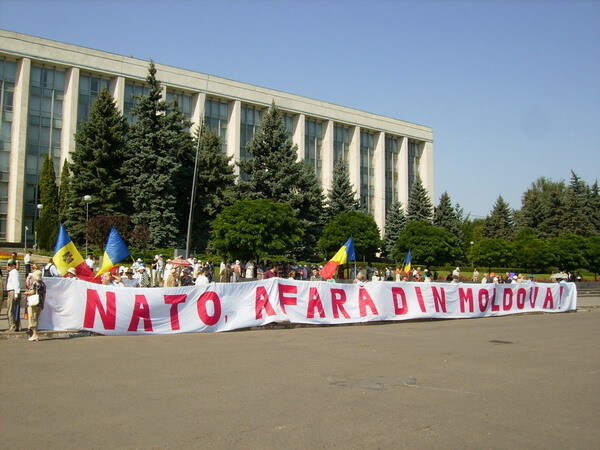 In 2004, the police state tightened the screws: RRP activists were accused of calling for the overthrow of the regime, while two National Bolsheviks were charged with criminal offenses after throwing packets of kefir at the OSCE representative in Moldova and several ambassadors from NATO countries. 2005 was a parliamentary election year. The police state continued its crackdowns against the opposition, while the PCRM pursued further its cooperation with NATO and GUAM. An RP member participated in the elections as an independent candidate. The influence of the PCRM amongst the masses fell: voter turnout in Chişinău was slightly over fifty percent. Nevertheless, the party won a majority in parliament (56 seats), which, however, was not enough to re-elect the president. Under pressure from the US, the leaders of two seemingly opposed parties, the HDNP (extreme right-wing nationalists from the former Popular Front of Moldova) and the PCRM formed a so-called red-orange coalition. After a few more deputies from other parties were bought off, Voronin managed to gain the number of votes necessary for his re-election. The PCRM used compromising material to force Chişinău Mayor Serafim Ureceanu to resign his post. Vasile Ursu, a member of the PCRM, was named the interim mayor, and the city council was taken over by coalition similar to that in parliament. Because of the PCRM’s total control of the city council, it became nearly impossible to obtain authorization to conduct social and political protest actions in the city: the authorities began to wholly ignore and simply suppress civic discontent. Indicative in this regard was the precedent set by the way the authorities dealt with the residents of a building whose electricity had been turned off. In 2006, the government began reforms of the housing and utilities sector. (A demonstration of citizens outraged by these reforms was banned the authorities.) The PCRM consented to a joint training exercise with NATO troops (Longbow/Lancer-2006) on Moldovan territory despite the fact that the country’s neutrality is enshrined in the constitution. The RP conducted a massive leaflet campaign against these exercises. However, the authorities disrupted attempts to hold an anti-NATO demonstration. It was even impossible to hold an anti-NATO conference: the authorities threatened the owners of the conference hall rented by organizers and sent police to the conference site. In response, the RP launched a petition campaign calling for prosecution of those officials who had violated Moldova’s constitutional neutrality. In 2007, the government announced a policy of total economic liberalization. The RP carried out an action in defense of the Cuban Five and against the establishment of a police state in Moldova. The RP likewise called for a boycott of the fourth round in the mayoral elections and carried out a massive leaflet campaign demanding that the system of municipal elections be changed to include the possibility of recalling all municipal council members. In response to a popular boycott of the first three rounds of the mayoral elections, the PCRM reduced the legally required minimal turnout from 33 percent to 25 percent. In the fourth round, which produced an extremely low turnout of voters, the PCRM’s candidate, Veaceslav Iordan, suffered a stunning defeat. The PCRM passed a law on the privatization of public property and put more than 260 state-owned enterprises on the auction block. The RP once again carried out a massive leaflet campaign against privatization. As a result, the PCRM for the first time gave up its “ritual” demonstration on November 7 (October Revolution Day), and the authorities were forced to denounce the text of our leaflet on national radio. In March 2008, we carried out an action of solidarity with imprisoned Romanian miners. The latest round of privatization is taking place as we speak. The targets of privatization include enterprises that are vital to Moldova, on the one hand, and “tasty morsels” for foreign investors, on the other. Already on the auction block are Carmez, Farmaco, Vibropribor, Orhei-Vit, UNIC, Moldtelecom, and Banca de Economii (the former state savings bank). Air Moldova (the state airline), Hotel CODRU (the national hotel), and the cafeteria in the parliament building are being readied for privatization. At present, the RP is gathering petitions from Chişinău residents who oppose the privatization Moldtelecom, Banca de Economii, and other companies. We are conducting this campaign in each of the city’s districts. Whatever residential building we go into, we take our petition to each apartment, and in this way we find out what people think about the privatization of the state sector (which is in essence public property). The RP is attempting to explain the present situation directly to rank-and-file citizens, to find out their opinions, and to send the signed anti-privatization letters to the parliament, the government, and the president of the Republic of Moldova. The reaction of people to our appeal varies from incomprehension to passionate support. However, the RP believes that it will be able to radically alter the situation and convince people that only active, unified resistance to the neoliberal regime can improve the material condition of all citizens, not merely a handful of foreign investors and the clan of party bigwigs. For the national economy should and must be made to work for the welfare of all Moldovans without exception.